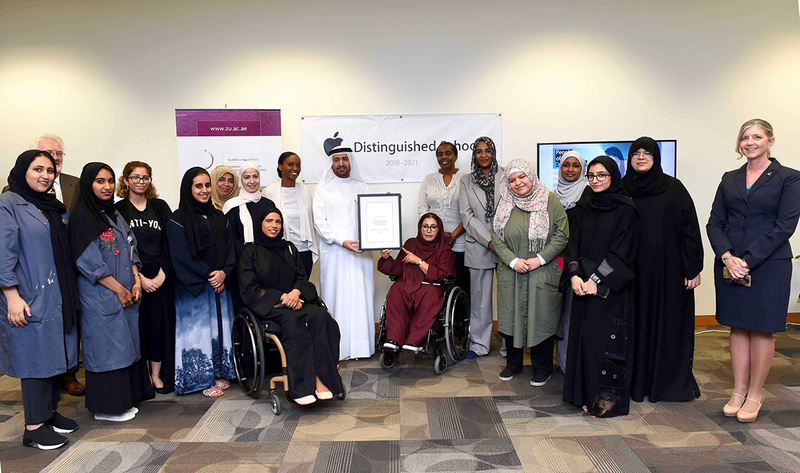 The Department of Student Accessibility Services (SAS) at Zayed University has recently been recognized as an Apple Distinguished School (ADS) for 2018-2021, for empowering Students of Determination through the use of assistive technologies and apps to successfully pursue their undergraduate studies. This is the second time SAS at Zayed University has been recognized as an Apple Distinguished School. Previously, SAS was acknowledged for its ability to unfold innovation into education, and run an educational excellence hub that utilizes Apple products to inspire creativity, collaboration, and critical thinking. The SAS department in Dubai and Abu Dhabi is committed to promoting innovative uses of technology in learning and teaching in an inclusive environment that fosters students’ academic success. Prof. Reyadh Al-Mehaideb, Vice-President of Zayed University, said, “The selection of the Department of Student Accessibility Services as an Apple Distinguished School highlights our success as an innovative and compelling learning environment that engages students and provides tangible evidence of academic accomplishment." Fatma Al-Qasimi, Director of the Student Accessibility Services Department, said, “Running a department dedicated to student accessibility with over 190 students, I feel honored for such a recognition. Zayed University has a unique and distinguished experience in implementing the most progressive technologies to enable Students of Determination, which includes physical disabilities and learning difficulties, to become independent learners, complete their studies and make a meaningful contribution to their local community and to the UAE society as a whole."